You are here: Home / News / News / Advocacy / Sharrows, really? After months of debate and deliberation, there is a new Commission Defined Option for Barnett Shoals. A CDO means the design came from the commission—not staff. The “new” design is an old one, slightly altered: sharrows. We are not surprised the Commission wants to return Barnett Shoals between College Station and Whitehall to 4 lanes. A lot of people out that way want to keep the Barnett Shoals as high-speed as possible. But we want to be clear: sharrows do not help people on bikes. And we think they are inappropriate on such a high-speed section of road. Bike lanes remain the best solution to increase comfort and safety for people walking, biking, rolling, and driving. Quoting the City of Cambridge, MA: “Shared lane markings are not a substitute for bike lanes but are a benefit on narrower busy streets.” Athens in Motion Appendix B-6 and B-7 recommend sharrows only on neighborhood bike boulevards. They are not recommended on 4-lane, high speed streets. 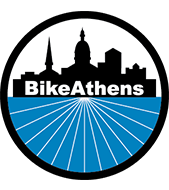 But BikeAthens! That guidance is for regular sharrows! 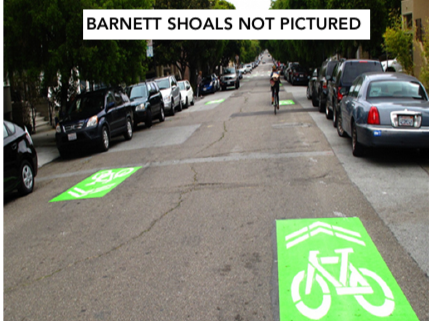 The ones shown above on an urban, neighborhood street have green paint behind them. Yes, the green-backed sharrow is currently an “experimental” design. (Note: the CDO available online still shows a continuous “super-sharrow.” The continuous-stripe design is not allowed by FHWA. 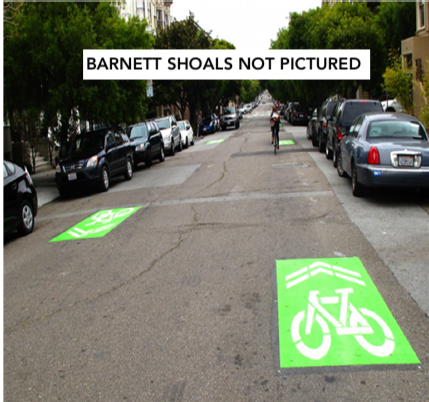 The CDO will call for the green-backed sharrow). Since the design is experimental, we do not yet know if they work better than a regular sharrow. What is clear—no matter what the sharrow looks like—it is not a bike lane. During the Barnett Shoals debate, there was a lot of talk about how protected bike lanes, a 4 or 5 star design depending on specifics, were not good enough. We heard that we should look to Athens in Motion for the final design; that the east side deserved the best of the best. As found in Chicago, doing nothing may be better than sharrows. The FHWA and Athens in Motion do not recommend sharrows on high speed streets like Barnett Shoals. This does nothing to help people on bike. We think the east side deserves better. We still believe protected bike lanes, or regular bike lanes, are the best solution for making Barnett Shoals a safe comfortable street for all of us.